After a few days in Hanoi I headed to Cat Ba, the largest island in the Cat Ba archipelago off Halong Bay. It's cheaper, quieter and safer than the more popular Halong Cruises which have a nasty tendency to sink in the middle of the night. I was unlucky with the weather which was overcast throughout my stay making painting trickier. Everything looked a bit grey and flat but at least it wasn't raining. Since I seem to spend more time discussing the food I eat than my paintings I ought to mention that the seafood was excellent. Fresh-as-it-gets squid grilled in lemon and garlic set me back about £3 and I had some utterly delicious lemongrass steamed crab from a streetfood vendor right by the sea for around £1.50. I did a day long boat trip around Halong Bay which is stunning even in gloomy weather. There was just enough time for a hasty painting on the pontoon while everyone else went kayaking but annoyingly lots of other boats kept mooring there and blocking my view. I had to hop around a bit and use a lot of artistic licence. After lunch we continued around the islands stopping once for a swim and then at Monkey Island. Once on the island I stupidly decided to tuck into a banana only to be descended upon by a barrel of monkeys and had to sacrifice my delicious banana for my life. In case you're interested 'barrel,' 'troop,' and 'cartload,' are all collective nouns for a group of monkeys, I had a hard time choosing. I'm afraid I had a minor melt down whilst staying on Cat Ba, it was well overdue and in the great scheme of things only minor. The locals were horribly invasive when I was painting, leaving me so frustrated and claustrophobic I was practically in tears by the time I'd finished my second picture. I left the main town and found a quiet spot to paint the Karsts and fishing boats from the cliffs but there was no escape. Given that I was the only person there I hated that they stood so close they were touching me and often pushing and jabbing at me and grabbing at my paintbrushes or moving my easel to get a closer look. They were almost all men, sometimes alone and at other times in groups when they would shout at me and each other excitedly in Vietnamese. I don't think they meant to be unfriendly they almost seemed a bit naive and fascinated by what I was doing, but I felt extremely uneasy and it got worse throughout the day. By the evening I was exhausted, miserable and unsatisfied with my progress. It wasn't just those particular men, that was the last straw after six weeks of thousands of photographs, unwanted selfies and being constantly jostled by tourists. I'm quite a solitary person usually and it suddenly all became too much. I called my parents in the evening to have a good whinge, they sounded anxious and tentatively suggested that if I didn't feel completely safe painting perhaps I should do something else the next day. So the following morning I rented a motorbike and learnt how to ride one for the first time. Mum and Dad I assure you it was fine and everyone else does it! (I'll quickly know if they are reeeeaally reading my blog). An English girl I'd become friends with on the boat trip and I had both been very keen to try it out and to see the rest of Cat Ba before we had to leave. So after a nervous start Kate and I scooted off around the island. Our first stop was the National Park where we were told it would take just over an hour to trek to the top of the peak and another hour back down. Neither of us had time for this before our buses so we decided to run it! We made it up and down within an hour and ten minutes, it was very, very hot work! The view from the top was incredible, a panoramic view of hills and forests rolling and dipping over the skyline. Here's a pensive photo of me at the top. After the hurried and even more humid descent we remounted and whizzed off to the Hospital Cave. This huge cave was used as a hospital and hideout for the last ten years of the Vietnam War. It was built in 1965, with thick, bombproof walls separating the seventeen rooms. It included an operating theatre and even a cinema and a swimming pool. Neither of us were expecting it to be nearly as impressive but we were speechless by the time we came out the other end. A must see for anyone going to Halong Bay. After such an exciting morning the mammoth journey ahead of me was a daunting prospect. A bus, boat and bus to Hanoi then a couple of hours before a sleeper bus up to Sapa where I would arrive at 6am the following morning. While on one of these endless buses I received an email from a Vietnamese journalist asking a few questions about my work for an article. The next day there I was in the Vietnamese news on a website which has more than a million viewers a day! I know it seems mad after moaning about being bothered so much, but I hadn't fully grasped what sort of page she was writing for. 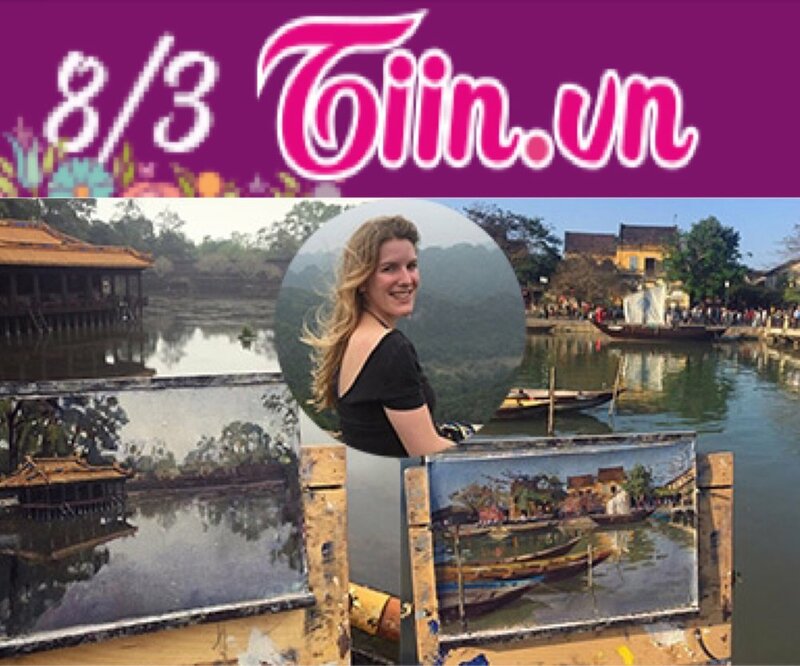 Anyway you can read it here: http://m.tiin.vn/chuyen-muc/song/nu-hoa-si-nuoc-xinh-dep-va-nhung-buc-ve-viet-nam-dep-me-hon.html or google 'Tiin Vietnam Alice Boggis -Rolfe'. Google gives a hilarious translation explaining how my paintings have left people sobbing all around the country and even caused people to move. Goodness know what it really says in Vietnamese? !